The Government expects to revise the import duties imposed on small cars and hybrid vehicles in the near future, depending on national economic factors, Prime Minister Ranil Wickremesinghe told Parliament yesterday. Responding to a question raised by Joint Opposition MP Bandula Gunawardana, the Prime Minister said that the minimum duty rates of Rs 1.5 million and Rs 1.25 million, for cars with an engine capacity below 1000cc and hybrid vehicles respectively, were imposed due to the increase in vehicle import expenditures having a negative impact on the balance of payment levels. The Premier said the vehicle import expenditure had risen to $666 million within the first five months of 2018, in comparison to the $316 million in the same time period in 2017. He noted that the expenditure for the importation of cars with engine capacities below 1000cc and hybrid vehicles had been 51.3% of the total vehicle importation cost in 2017, which has risen to 78.9% in 2018. In addition, the Premier rejected claims by MP Gunawardana that those who had opened letters of credit to import small cars before August this year were allowed to clear their vehicles without paying the recently increased import duty. 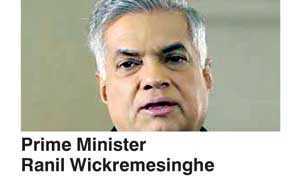 Prime Minister Ranil Wickremesinghe told Parliament yesterday that a fuel price hike was imminent, as a result of the US economic sanctions imposed on Iran. The Premier made this statement while responding to a question raised by Joint Opposition MP Bandula Gunawardana regarding vehicle import duties. “The US sanctions on Iran could affect Sri Lanka adversely. We don’t know whether this would result in an oil price hike, as Sri Lanka currently imports Iranian crude oil. However, we will have to be prepared to face any adverse situation,” the Prime Minister said. He said the current trade war between China and the United Sates would also have an effect on the island.The Premier said that Sri Lanka must be prepared to face such situations caused by global developments.